I’m the girl who prefers one rose instead of a dozen. I’m the girl who would rather stay in on a Friday night than go to a wild party with random strangers. I’m the girl who wouldn’t make you wait on her hand and foot, but would do anything to make you happy. I’m the girl who would enjoy having a movie night rather than going to some fancy restaurant. I’m the girl who would rather stay up all night sharing secrets than going out and getting drunk. I’m the girl who won’t make you hold her bags, but would rather hold your hand instead. I’m the girl who will love you more than anyone can possibly dream of. 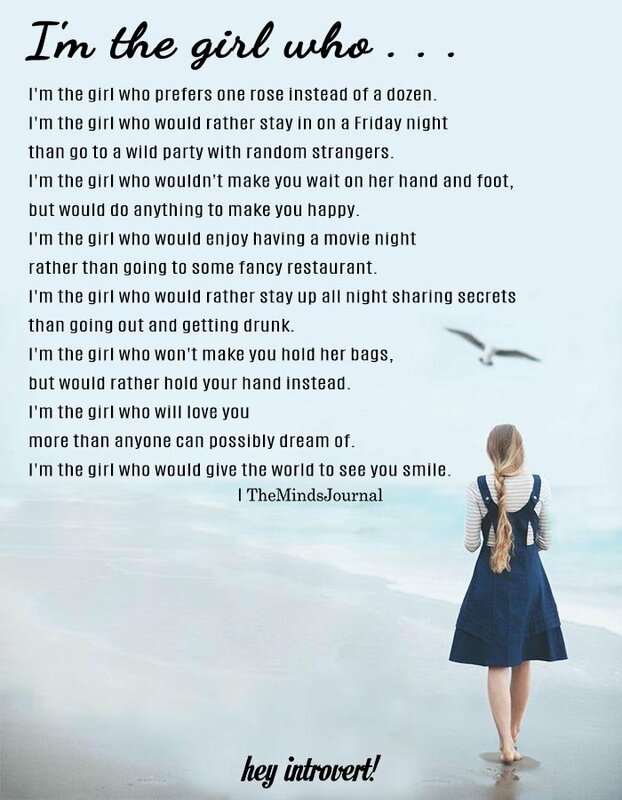 I’m the girl who would give the world to see you smile.